As mentioned in my post ‘Do I need talent to sing’ I finally found the time to write about learning to sing on pitch. Some people believe that singing on pitch is something you cannot learn, you can either do it or you can’t. This is, however, incorrect. In fact, anyone (unless you are tone deaf) can learn to sing on pitch. It is just like any other skill, if you have the right teacher you can learn it and it actually doesn’t take that long. Below, I will explain how to learnt to sing on pitch in 5 steps. First things first, how do we actually change our pitch when we sing? If you imagine that your true vocal folds (true vocal cords) are your musical strings, like the strings on a guitar. The thinner the string the higher pitch, the thicker the string the lower the pitch. This principle applies to the voice as well. With higher pitch the larynx raises and it lowers with lower pitches. Finally, the true vocal folds vibration change with pitch. The true vocal folds vibrate very fast – from 100 to 1000 times per second, depending on the pitch. The higher the pitch the faster the true vocal folds vibrate. So, there are a few things that change with pitch: Larynx height, length of the true vocal folds and vibrations per second of the true vocal folds. To experience your larynx, please put your fingers softly on your Adam’s apple (it is the first bump down from your chin), and yes, it is the Adam’s apple for both men and women. If you swallow, you will feel your larynx going up and coming back into its initial position – the resting position. If you yawn, your larynx will drop and come back up into its initial position. If you now keep your finger on your larynx and siren up and down your range on ng as in ‘sing’ (just like a siren), you will feel your larynx move up and down with pitch. Experiencing their larynx, is a first and very important step for students in understanding voice production and pitch control. One of the biggest mistakes is to practice or teach pitch with a piano or other musical instrument. The piano has many overtones and unlike a musically trained ear, a beginner will hear all other frequencies the piano produces equally loud as the fundamental frequency. That is why they will not be able to reproduce the same pitch as the key you are pressing – they hear all other overtones as well and cannot judge which one they will need to sing. Also, they don’t know the feeling of when they are singing the ‘right’ pitch yet which I will get to. So instead of tuning in with a piano or other instruments it is easiest to practise with a human voice, ideally a female voice practises with a female teacher and a male voice with male teacher. 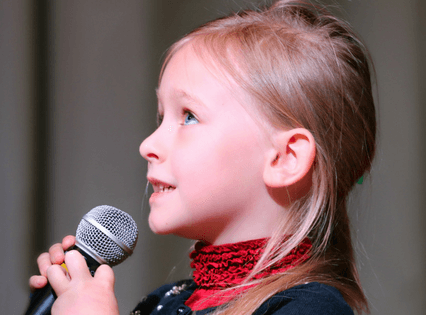 Instead of singing a note and getting the student to match it, I usually start the other way around and ask the student to sing any pitch, usually in their speaking range. I will then match that pitch. Then, I will ask them to go up in pitch and I will follow them. Then I will ask them to go down in pitch and I will follow them. We do that for some time. They will get an initial feeling on changing pitch first of all and signing the same pitch as I do. As a next step, I usually work with solfege like do-re-mi. I will then sing a major scale while I am also using my hands to signal the pitch I am producing. I ask the student to join me on this. I have found great success in employing this with students and I usually start playing along with the piano too, but I am still singing with the student. With beginners, you will need to keep singing along with them. You cannot expect them to be able to just sing by themselves. It takes a few lessons until you can let them sing the scales by themselves. Research has proven that employing hand signals accelerates the learning process as the brain finds it easier to make a connection. Like with anything, practise makes perfect. I usually ask my students who have never learned to sing to also train their aural skills. There are great apps out there that are for free. Although hearing pitch or recognising pitch is not the same as singing it, it is the first step in singing the right pitch. The better aurally trained the easier it will be to sing on pitch as well. Some apps will also allow you to sing intervals for example and it will tell you if the note produced was correct. This is something I will ask my students to do who have more or less mastered singing on pitch. Since it is a computer judging the pitch, the pitch needs to be spot on to actually pass so it will be difficult for beginners. Most beginners will not be able to tell you if they are singing too high or low in pitch if you tell them they are off pitch. This is where pitch matching comes in handy. How it works: I will ask the student to sing a random note, I will then either match it, sing a harmony or sing a note that does not harmonise with theirs. I then ask them if they think I am singing the same note. I will do that a few times and then we talk about how it feels when we sing the same note, when I sing a harmony and when I sing a note that doesn’t harmonise with their note. I then do the same with the piano, so they learn to hear and feel when their voice matches the piano and when it doesn’t. These easy 5 steps above have not failed me yet in teaching someone to sing on pitch. If you want to teach beginners you will need to be patient and you will need to be prepared to sing a lot yourself. If you are, it will not take you long to teach them pitch. The reward for doing so is amazing!! This entry was posted in Singing and tagged learntosing, singingintune, singingonpitch.